Sarah wasn’t ecstatic about her marriage. They had their problems—didn’t everyone? They argued about money and just didn’t seem connected anymore. She was sad about that—and he could make her so angry at times—but she’d made a commitment and had three kids. She was hanging in there for them. They were her life. And besides, it scared her to think about being alone for all kinds of reasons. But on a Sunday morning she’ll never forget, David announced that he wanted a divorce. And he wanted to move forward quickly. She could tell he was trying to be kind as he made his awful announcement but Sarah barely heard what he said after that. She was shocked. And terrified. Monday morning, she met with a lawyer. He’d file a motion immediately and ask the judge to award her full custody of the kids and the maximum support possible. He suggested that David be sent a long list of written interrogatories about his assets and income which he’d have to answer under oath. He gave her a stack of forms to complete. But something just didn’t sit right with Sarah. The lawyer was eager to get them in court and let a judge decide. Maybe that was the right thing to do. She didn’t want to be taken advantage of after all. But that afternoon she called Berecz & Associates, PLC. She talked to Tammy and got an appointment with Meghan. That was a whole different meeting. Meghan first asked what kind of life Sarah wanted after the divorce was over. What? All she’d been able to think about was how terrified she was. But she knew one thing: she wanted her kids to suffer as little as possible. She wanted them to feel secure and know that both their mom and dad loved them. She didn’t want them to be anxious at soccer games and graduations about their parents getting into a fight. She was so angry at David right now but she didn’t want that to spill over to the kids. She told Meghan that her kids were still the most important thing to her and she ultimately wanted a workable relationship with David. And she wanted to be okay financially too. Meghan talked with her about the possibility of not immediately jumping into the court process and instead exploring whether she and David could develop their own settlement through mediation. After all Meghan said, 98% of cases settle outside of court so why not start by engaging in settlement discussions right away? They could always use the court later if they couldn’t agree. This made sense to Sarah and she took the materials Meghan gave her and decided to talk to David about mediating. Meghan assured her that life would get better than it felt right now. David wasn’t sure about mediating but agreed to meet with Meghan too and learn more about it. When he did he felt it was the best option for their family. Sarah still worried about how she’d make it financially but knew so many of her kids’ friends’ parents who were constantly battling with ex-spouses and in and out of court. She just didn’t want that for her kids. But her mother and best friend weren’t so sure. They thought she should hire the best lawyer and fight for her rights. She deserved to get every dime possible from David. He was the one who wanted the divorce after all. Sarah didn’t know which way to go. But David wanted to move ahead with this and she knew she needed to decide soon. She went for a walk by the lake and thought about her future without David. She thought about being a single mom and making it on her income and support alone. She thought about the kids spending time with David and with her. She added her tears to the sand. Who did she want to be as a single person? What kind of divorce did she want? Was she capable of mediating directly with David? She realized that yes, she was scared. And there was some appeal to just hiring a lawyer and letting him protect her. She knew David would then do the same. She saw them each retreating to their own corners, determined to fight. But Sarah also knew that she ultimately was the one who would be left dealing with David and their post-divorce life. She knew her kids would be smack dab in the middle of all that. Sarah wanted to give them all the best chance possible to have a positive life with as little continuing conflict as possible. She would give mediation a chance. Mediation may or may not be the best option for you. The traditional process is right for some, collaborative process is right for others. 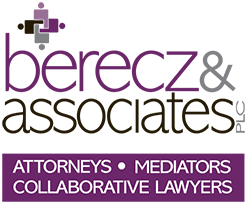 We encourage you to first identify where you want to be one year after your divorce is final. Then explore the options available and choose the one that will best get you there. To learn more, call and schedule a time to meet with one of our lawyers. Click here to call us right now!